In what we can only assume is an homage to the re-launch of Unicorn Booty, a gay Hollywood power couple rode into their wedding on what they called a “Jewnicorn.” Cougar Town producer Danny Rose married Aaron Rosenberg last Saturday on the lot of Paramount Studios. 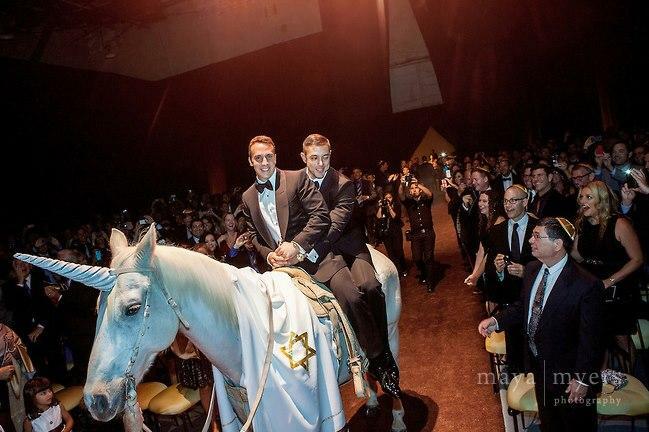 They sat astride a unicorn with a white Jewish prayer shawl embroidered with a gold Star of David, draped across its long equine neck. Psy made a surprise appearance, singing “Gangnam Style” at 1 a.m. Earlier in the evening guests like Courtney Cox and Busy Philipps danced to musical performances by Ciara, John Legend, Joss Stone, and a video tribute by Jennifer Lopez. Two Jewfros and Ciara in an Afro perform at the Jewnicorn wedding. Psy at the Jewnicorn wedding.